One of the hottest news in F&B industry in New York last year - the left of famed sushi chef Masato Shimizu (or Masa) for Bangkok with his wife. Masa-san worked as the master chef at Jewel Bako for four years and brought a first star to the restaurant,y and proudly became the youngest chef ever to have been honored with a Michelin star in New York City.In 2006, he left Jewel Bako and opened 15 East with Marco Moreira and Joann Makovitzky. By Masa's legendary skills, 15 East was soon honored its first Michelin star, and Masa-san himself was named a 2007 New York Rising Star Chef by StarChefs.com. Since marrying his Thai-Japanese wife who lives in Bangkok, Masa-san decided to move to Bangkok, Thailand. This Janurary, his exclusive traditional sushi bar Sushi Masato was opened in one of the busiest districts in Bangkok. 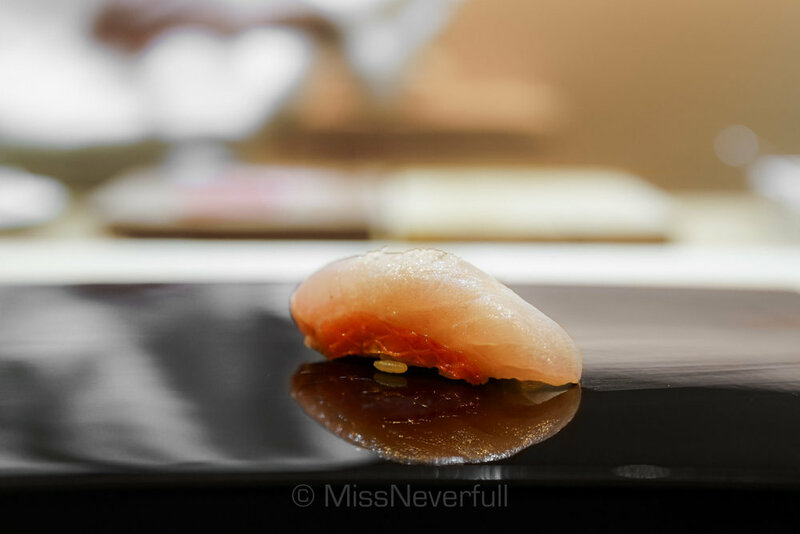 Served only omakase by Masa's artistic skills that enriched from an experience of more than 20 years surrounding sushi in Tokyo and New York, Masa-san brinngs one of the best sushi experiences in Bangkok. 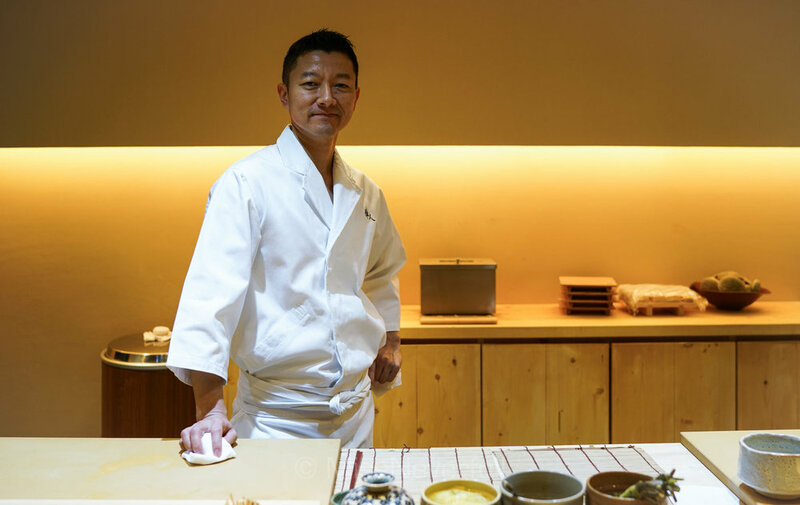 Similar to traditonal sushiya in Japan, Sushi Masato features a L-shaped sushi counter where the chef makes the most fresh nigiri in front of you. The interior is clean and Zen, i cannot believe i am here in Bangkok. Most suhiya in Thailand doesn't use real Hinoki wood to make the counter table, and Masa-san imported real Hinoki wood from Japan to create a real Zen touch. Reservation is quite tough without strings, i made my reservation in Feburary for my April trip. When i eat there in late April, chef Masa told me that reservation is already full for September. Cannot believe it is so hard to get a sushi reservation outside Japan. Dinner kicked off with assorted appetizers. First arrvies edamame, followed by Japanese rock oysters with ponzu which was quite large and umami, it left a mouthful of mild sweet flavors. Next comes slow-cooked abalone served in its shell with it broth, topped with its liver paste. The texture was rubbery but soft and tender at the same time, i really loved its aroma as well as umami taste, its liver was deeper in flavor which matches well with the abalone itself. Its broth was cooked with Kombu to enhance the umami flavor. A harmony abaloney dish. 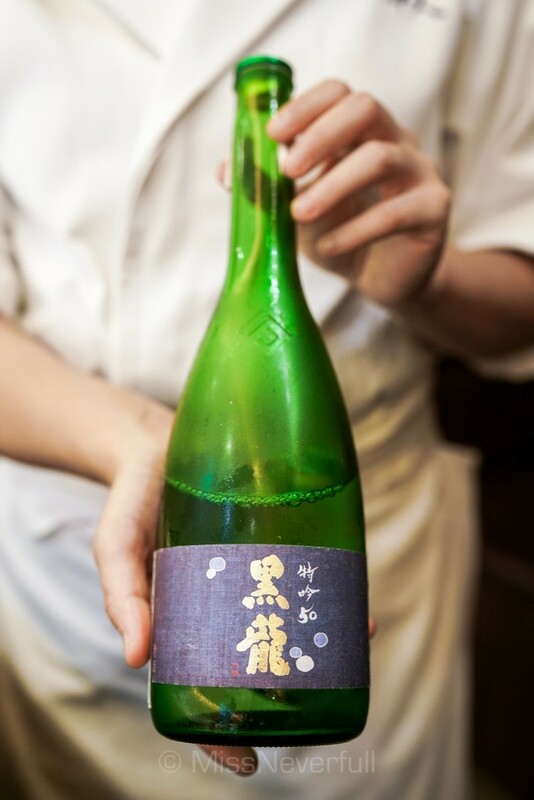 Masato serves fresh and seasonal ingredients from Japan, to guarantee the best quality, the fish is sourced from Tsukiji market 4 to 5 days a week (as sometimes Tsukiji closed on Wednesday too ). Each fish is carefully taken care of by chef Masa, include cleaning, preparing, and storing; whether with a pinch of salt, marinate in vinegar or sudachi (Japanese lime) to make sure to serve them at the best. Next we were served Shio-uni, or salted sea urchin in fresh sea water from Hokkaido. Compare to the regular uni, this one has a deeper oceanic flavors, while its creamiess and umami flavor stills. Compare to the fattier Katsuo in late Autumn and Winter, i prefer the young Katsuo in Spring season. The flesh is leaner but still very deep in flavor. Monkfish liver is not included in the Omakase menu of the night, it is an alternative choice for guests who don't eat shell fish. I do eat everything and i requested it when i saw chef Masa preparing it for other guests. The very last season to eat monkfish liver and i'm so glad to have this creamy goodness here. This lovely tomato really surprised me. By using the Japanese tomato grow in Phetchabun in Thailand, it was simply boiled and peeled and finish with a touch of fleur de sel (salt from Masa's wife's uncle's farm in south coast of Thailand) to bring out the sweetness. Very nice palate cleanser and too opens my palate for the nigiri feast. I am so lucky to be here today as Chef Masa ordered white baby shrimp from Japan, one of my favorite seasonal products. Those shrimps are so creamy and become even more creamier as you chew them, their sweet flavors are nicely bring out by the shari - combined with Akazu (red vinegar) to enhance the flavor of the neta (fish). The size of shari is smaller than most sushiya ive been in Tokyo, similar to Shinji in Singapore, which i personally prefer so that i can try more fish. The flavor is right to point. 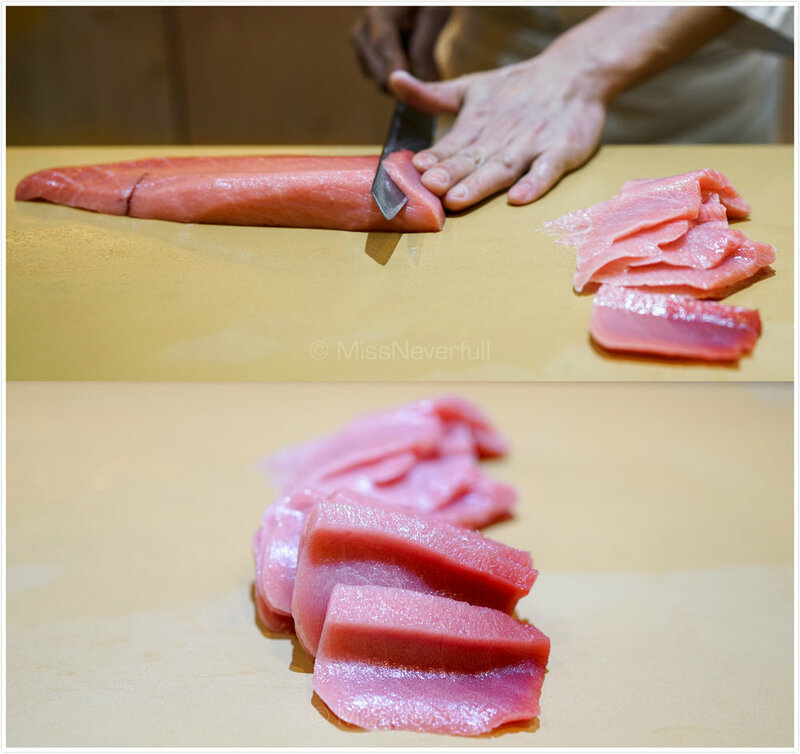 You may think that the skill a sushi chef based in NYC and Bangkok may not be trust worthy compare to those in Japan, but i have to say that, i am really surprised that Chef Masa is so skilled and i really enjoyed watching him making the sushi. The shape, the coeherence, the firm, flawless. Even better than some famous sushiya in Tokyo. The seasonal shell fish Torigai is fresh and crunchy; followed by Kasugo - is a kind of baby Tai (snapper) which serves in Spring at its best. The flesh is very tender and clean, well-balanced taste. Chef Masa's knife work is pretty good too. Chef Masa is very proud of his smoked Kinmedai with real charcoal wood. The surface of the Kinmedai cut is rarely touched with the charcoal, which brought an lovely char fragrance. Finally comes everyone's favorite Toro. Chu-toro has moderate oil contents and melt-in moouth tender, its deeper and umami flavors balanced so well with the Akashari. Otoro is much fattier and creamier, of course it is delicious and Masa-san serves a top quality piece, but i personally perfer chu-toro as otoro is always too rich for me. I love Kohada while not every fancy sushiya can make a quality piece of Kohada. As the silver fish is hard to keep fresh, chefs usually process Kohada with vinegar to enhances its flavor and makes the flesh more tender. I was quite surprised by Masa's Kohada, it was vinegared thus heavier in tastes, while the entire bite is such a harmony. I added one more piece of Kohada at last. The most impressive piece of the night is deinitely Kuruma Ebi. It is large insize, Chef Masa takes out its shell in front of us, after he shaped the nigiri, he again sauced the nigiri with Ebi miso - which i believe is an essence of the shrimp. The outcomes is obviously delicious, which burst of umami flavors and a unforgettable sweet aftertaste. I also enjoyed its tender meat. Oh i need one more of this. 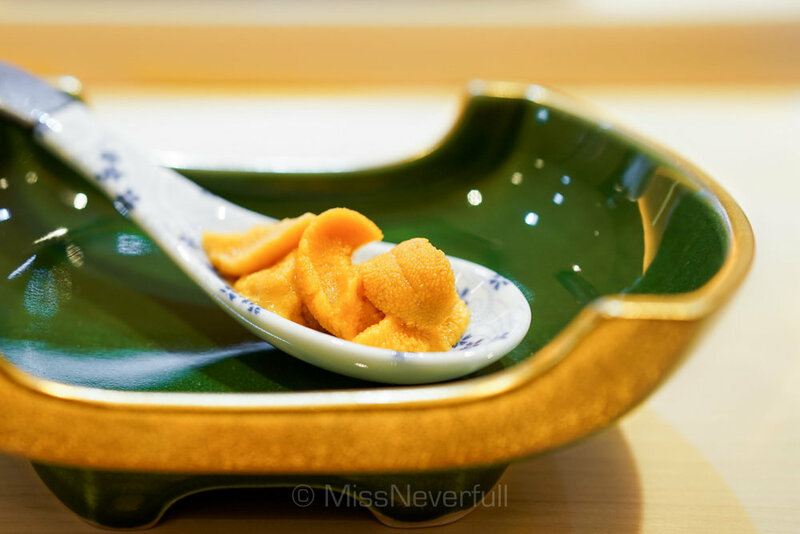 This mini uni bowl consist two types of uni: Murasaki and Bafun. See the creamy and pretty layers - they are just as good as they look, oh no, tastes are even better. So fresh and sweet. I wish i can have a 12' cake of uni next year! Unagi with nitsume (sweet sauce) is a top pic by a lot ot locals, it was served warm and aromatic. Since it is not the best season to eat unagi, i personally think the Anago is a bit dry on its surfice, the flesh was on the leaner side which is not hard to understand. One of my favorite item of the meal is Negiroro hand roll, made of fine chopped toro, spring scallions and wasabi, and served on a thin and crispy seaweed. It was a mouthfull of creamy and melting toro together with crispy seaweed and fragrant scallions. Wonderfull. I must say Masato's tamago is so perfect for my liking. If you are a big fan of sponge-style tamgo, i'm sure you will like it too. It is so airy and moist, also packed of umami flavors of a balanced sweet and savory tastes. For the dessert part, we were firstly served with homamde yuzu granita to cleanse our palates. Next comes the damn good Mineoka Tofu, which is Japanese mily tofu, with black sugar syrup. The texture is firmer than sily tofu but so smooth and delciious with the syrup. I never expected such a great sushi experience outside Japan, i may not say it is the best in Bangkok as i haven't been to other sushiya in Bangkok. But Masato's skills, the quality of ingredients, amabince and service, can definitely compete with some sushiya i have been in Tokyo. Plus its more pocket-friendly price tag at 4000 THB (USD $112, JPY 12300, SGD$155) for omakase sushi with a Michelin-starred quality, it is not hard to understand the succeed of Sushi Masato in such a short time. My final cost = omakase + sake + 2 added sushi + added Tsumami = 7000 THB (US$196, SG$270K,JPY 21600).